the checkered area symbolizes the finish of a motorsport race. This rare Eberhard Extra-Fort Chronograph Ref. 31006 is something for racing lovers. The checkered area on the dial symbolizes the finish of a motorsport race. The flag is commonly associated with the winner of a race, as they are the first driver to "take" the chequered flag. Eberhard was founded in 1887 and is one of the first wristwatch manufacturers. Eberhard produced some attractive and reliable chronographs, which are very popular and sought after today. 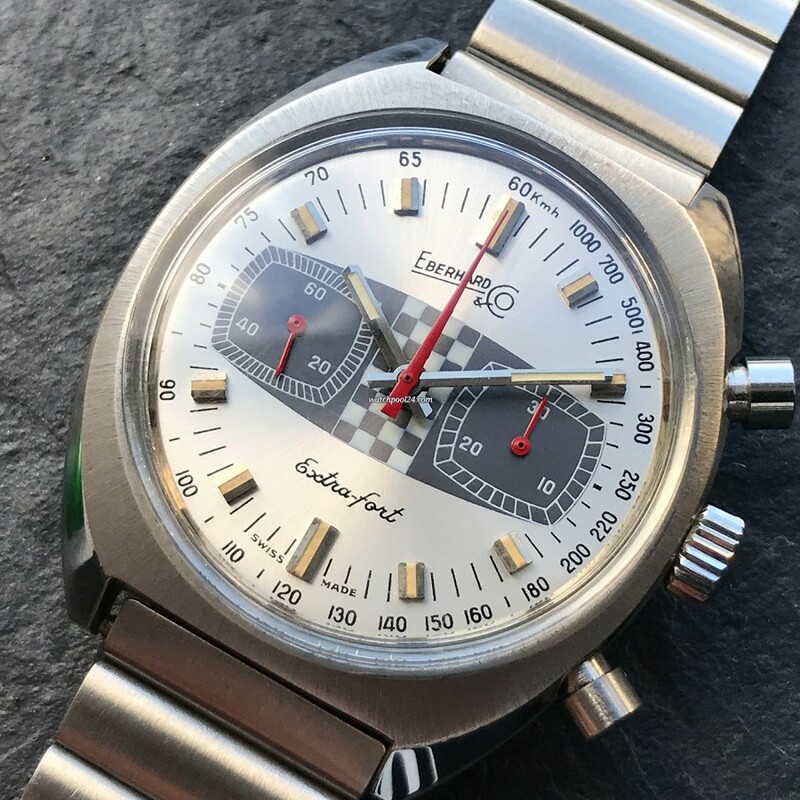 Here we offer you a great example of the Eberhard Extra-Fort 31006 from the early 1970s. Some striking features give this watch a special character - the oval case shape, beveled lugs and of course the beautiful racing dial. Despite its age, this watch has an excellent overall condition. The stainless steel case has a thick profile and the original brushed finish can be seen on the case. A truly highlight of this watch is its dial. Not only because of the design, but also because of its wonderful condition. No scratches or any defects at all. The luminous material in the hour markers and in the hands has a beautiful creamy color. The chronograph second hand and the hands in the sub-dials are red. The dial features an outer tachymeter scale. On the case back all engravings including the reference number are still visible. This watch comes with an interesting collector's accessory, which is unusual and rare for Vintage Eberhard watches: The original blue Eberhard hang tag signed with the reference number and the former selling price in Italian Lira. The movement of this Extra-Fort 31006 is the in-house Eberhard manual-wound caliber 324. The watch has been checked and runs flawlessly in all functions. The Eberhard Extra-Fort 31006 is accompanied by a beautiful racing stainless steel bracelet in great condition. The clasp is signed with the Eberhard "E".